The EUROCOM Panther is a fully upgradeable, ultra high performance computing solution that can be configured as a Mobile Server (EUROCOM Panther 5SE), Mobile Workstation (EUROCOM Panther 4.0) or 3D laptop (EUROCOM Panther 5D). Eurocom utilized a high performance desktop replacement chassis with the highest quality mobile components, such as the Intel Xeon E5-2687W, with 8 cores, 16 threads and 20M cache, up to 32 GB memory and Enterprise Class Solid State Drives that are able to support server class and professional workstation operation. “We have customers using our Panther for a wide range of professional applications such as software development, mobile server operation, engineering and design, geographical information science, simulation and so on. Customers are coming to Eurocom for the Panther because they trust the quality, reliability and performance the system offers them” Mark Bialic, Eurocom President. As with all modern scientific and technological endeavors, computers and software play an increasingly important role in engineering, design and science. As well as the typical business application software, there are a number of computer aided applications or technologies specifically for engineering. Computers can be used to generate models of fundamental physical processes, which can be solved using numerical methods. To run these intense programs, such as CAD, CAM, DMU, CAE and 3D modeling the engineers require large amounts of processing power. With Eurocom’s Mobile Workstations, such as the EUROCOM Panther, engineers can develop and fine tune their design outside the office and still have the capabilities of a high performance desktop station at ones disposal. Using Eurocom Mobile Workstations on a job site or as a sales tool for live demonstrations of virtual walkthroughs and 3D modeling gives an edge to companies. Next to all the obvious advantages of a mobile workspace, such as having the ability to work anywhere and reduce downtime, there is an opportunity for engineers and designers that Eurocom defines as Rapid Engineering Deployment (RED). RED is defined as a strategy that enables an engineering team to have hand-carried, high-performance, computer-based engineering capability, which enables them to be deployed anywhere in the world. Inflexibility of the engineering team can considerably increase the duration and inefficiency of a product’s design process. If the engineering team have the chance to work on-site and communicate directly to each other and with the customer, this could drastically decrease development costs caused by miscommunications and increase the speed to market of the product or project. Digital Content Creation (DCC) is one area that is growing daily along with the growth of the internet. The ability to receive feedback and make adjustments on the spot compared to the current model where the engineering or design team is tied to their office will prove to be beneficial for the speed to market and the reduction of development costs. The Rapid Engineering Deployment concept can be deployed in any organization that has a product design or development department. In the last decade the economy has increased in global trade, travel and business dealings. With this, the development costs have increased due to travelling, increased downtime, miscommunications, et cetera. Eurocom mobile workstations can decrease these development costs and give the company the competitive advantage to compete on the global market. The main strength of Eurocom’s Mobile Workstations are that the engineering or design team has the opportunity to discuss the design with the customer and third parties face-to-face with the same computing technological capabilities as in their office. A great feature of Eurocom’s Mobile Workstations is that a customer can configure the products to its individual needs and get the exact system and components that they require, while only paying for what they need. 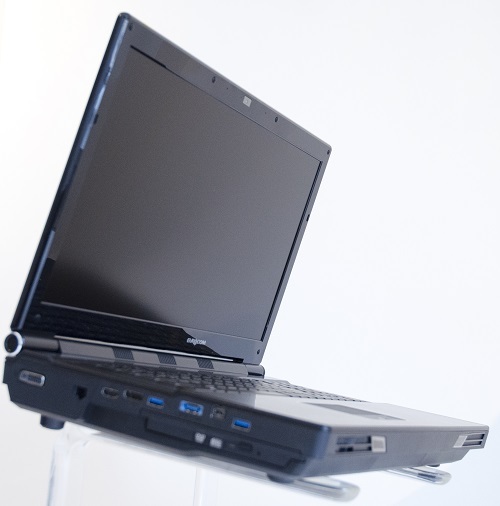 Depending on the chosen configuration, the EUROCOM Panther can be optimized for a variety of applications. Based on the Panther form factor, Eurocom has created three products, the EUROCOM Panther 4.0, Panther 5SE and Panther 5D, which are described in more detail below. The EUROCOM Panther 5SE provides fast deployment right out of the box, combined with easy relocation. The ability to hand carry the system make the EUROCOM Panther 5SE an extremely easy system to travel with while providing server capabilities. Unlike conventional servers the EUROCOM Panther 5.0 Server Edition weighs just 12lbs/5.5kg and is equipped with an integrated keyboard, 17.3” LCD Display, touch pad and Uninterruptable Power Supply (Battery Pack). The EUROCOM Panther 4.0 is a Workstation class Laptop with support for professional class NVIDIA Quadro K5000M, K4000M, K3000M, K2000M graphics. The EUROCOM Panther 5D is a 3D enabled system complete with a beautiful full high definition 1080p 1920x1080, fast refresh 120 hz panel, built in 3D emitter and NVIDIA 3D Vision 2 glasses for 3D operation on the go. EUROCOM Panther 5D delivers unmatched 3D capabilities for heavy duty 3D and 2D applications, like CAD (Computer-Aided Design), CAE (Computer-Aided Engineering), DCC (Digital Content Creation), visualization, and simulation. It is ideal for Engineering on the Go and for Rapid Engineering Deployment Teams. The Panther 5D is equipped with dual MXM 3.0B slots rated for 100W GPUs and is ready to SLI the fastest NVIDIA GPUs. For heavy duty rendering where the utmost accuracy is required, the Quadro K5000M’s ECC (error correcting code) memory is up to the task. NVIDIA Quadro cards offer OpenGL quad buffered stereo support, for a smooth experience working with complex 3D models. Eurocom’s 3D on the go Panther Workstation provide opportunities for professionals to operate Virtual Labs on the Go, 3D Scanning on the Go and Engineering and Design on the Go. Having 3D capability with the professional grade hardware offered by a Eurocom 3D Workstation allows for design of new products anywhere in the world while offering engineering capacity onsite, anywhere, being able to reduce time to market, downtime and development costs of projects.